A still image from the recent footage. 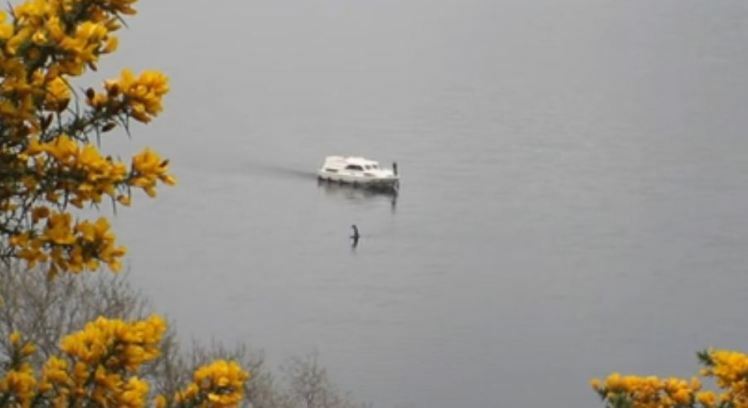 Rob Jones, 35, of North Wales, England, captured footage on May 7th of something strange moving across the water of Loch Ness. The unidentified object can be seen sticking at least several feet out of the water, and moving perpendicular to a nearby boat. Some speculate that it might be the loch's infamous monster, although others aren't so sure; including Mr. Jones. The North Wales man wasn't alone in witnessing whatever was in the loch, as a large group of tourists joined him in watching and taking pictures of the object as it moved close to the passing boat before disappearing. “I saw it quite far across the Loch near the castle, but by the time I stopped the van, It was very close and other people stopped to take photos too," said Jones. May marks the end of an eight month dry spell for purported sightings of strange activity in the loch. Along with Jones's video, a picture surfaced earlier this month of another unidentified object in the waters of Loch Ness. 28-year-old Hayley Johnson of Manchester, England, saw a strange dark shape at dusk in the loch’s Urquhart Bay. “I couldn’t believe my eyes," said Johnson. “I am a really skeptical person. I have never even been to Loch Ness before but I decided to come up for the Bank Holiday. I had stayed in a backpackers’ hotel and on my last night decided to go for a walk through the woods and ended up on the banks of the loch. It was lovely and at dusk." “Then about half a mile away I saw this dark shape sticking up – like a neck. I thought at first it was a tree, but it was very strange. I took a picture. It was there for a couple of seconds, but when I looked back it was gone. I was shocked." “I was really excited about Nessie as a child but to be honest I thought Nessie had probably died in the 1930s." Gary Campbell, the official recorder of Nessie sightings, is understandably relieved to see a resurgence of Nessie sightings. “I was quite worried that there had been an eight-month gap since the last sighting and so was the whole world it seemed. I fielded calls from around the world – from Moscow, Adelaide and California, everywhere, asking what had happened to Nessie?" “I am relieved and delighted with this sighting – and so will be the planet!" According to Campbell, Nessie sightings are more prolific in the summer months. "The reason for the summer sightings is twofold - there are more people around in the summer but more importantly, there are much longer daylight hours and the weather tends to be better." The last sighting prior to this month was in August of 2016, when Ian Campbell was bicycling along the western side of the loch with his son and a family friend, and saw what he described as two 33' long creatures in the loch.